Buffing and polishing using wheels and 'compounds' is somewhat like using wet and dry sanding paper, only much faster. Instead of using 'elbow grease' you will be using the power and speed of an electric motor. 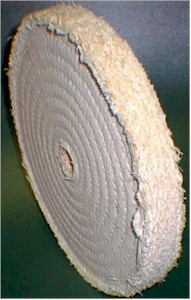 The edge, or face, of the wheel is the 'sanding block', which carries a thin layer of 'compound' which is the sandpaper. 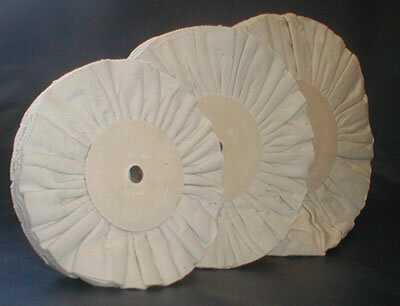 Varying types of wheel are available, and the different grades of compound are scaled similar to sandpaper. The compounds are made from a wax substance which has the different abrasive powders added to it. When this hard block is applied to the edge of a spinning buffing wheel, the heat from the friction melts the wax, and both wax and abrasive are applied in a thin slick to the face of the wheel. The objective of buffing and polishing is to make a rough surface into a smooth one regardless if it is a pice of plastic or an expensive gold pice. Of course, each work piece will be in a different condition, so will need different procedures. Imagine the surface magnified thousands of times, it will look like jagged mountains and valleys. By repeated abrasion, you are going to wear down those mountains until they are old, soft, rolling hills! Then they will not dissipate the light, but reflect it. It is the reflection that makes the buffed part appear shiny. Sand the inside of the part with emery paper. This will show you exactly where the dent is. Using a piece of end grain wood as a block, gently beat out the dent with a hammer. Offer the jagged blade to the edge of the spinning wheel, and work it across the face until the wheel looks bright and fluffy once more. This action, done periodically, will remove entrapped metal particles, which could scratch a more delicate part. Swirl marks caused by buffing in the final stages can easily be removed by wetting the part with a damp cloth, then dusting with a powder such as:- Whiting, Talcum Powder or Corn Starch, then buff on your wheel again until the swirls disappear. Applying different compounds to the same wheel only causes problems, because you end up with a mixture of abrasive surfaces, and metal deposits left over from the more abrasive operation. These microscopic particles only scratch the surface, destroying any benefit gained by the finer compound. To remove excess compound from the work, apply a small amount of talc to the work and the wheel, then rebuff. LITTLE & OFTEN is the rule. Too much compound will reduce the effectiveness of the cutting action, because the surface will become TOO greasy and over lubricated. This can often be seen by the prescence of a black slick of compound that seems to reveal around the work piece. Apply compound to the wheel for approx 1 second. Any more is wasted. There are different types of wheels and these have different effects on the compound they are used with. 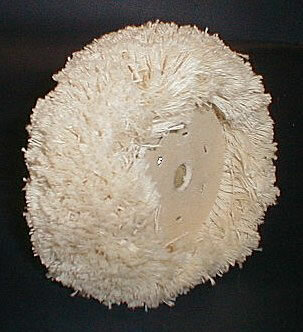 For example, the SISAL wheel is a coarse 'rope like' fiber, which frays out to make a sort of brush. 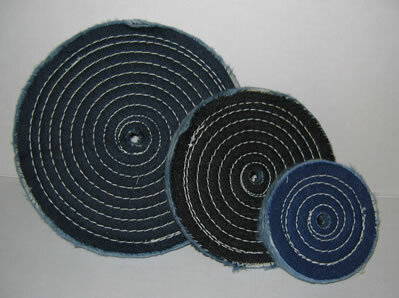 These fibers have a very beneficial effect on scratched and rougher surfaces, almost stroking them smooth. When used with a course 'EMERY' compound, they 'cut' the metal down very rapidly. 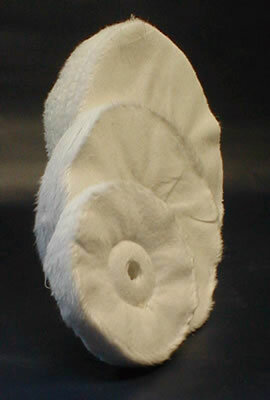 You could use this compound on a SPIRAL SEWN wheel and it would work, but the job would take much longer because the softer SPIRAL SEWN wheel is not going to thrash the metal so aggressively. As you progress through the buffing compounds, you will change your buffing wheel, ending up using a soft polishing wheel,such as the CANTON FLANNEL with the least abrasive BLUE or RED compound which only polishes, it has no cutting action. So, depending on the job in hand, you will determine which abrasive compound and wheel you are going to use first, then step down through the stages until YOU are satisfied with the results. Compounds are made from a mixture of fine abrasive fillers and a sort of greasy wax. The compound is melted, by friction heat, as the bar is pressed to the revolving wheel. This applies a thin layer of abrasive, 'glued' onto the cloth wheel, making it similar to an emery paper, only much faster! Do not apply the compound after the workpiece, or on its own. This wastes material and is much less efficient. By applying the material before the workpiece, you actually use the workpiece to force the compound into the buff. This is much less wasteful, more efficient and will actually speed up your buffing times. The table above show the THICKNESS of wheels. You may use multiple wheels to make up total permissible width. There are two basic buffing motions you should use. 1. CUT MOTION gives you:- SMOOTH SURFACE, SEMI-BRIGHT & UNIFORM. The workpiece should be moved AGAINST the direction of the wheel, using a MEDIUM to HARD pressure. 2. COLOR MOTION gives you:- BRIGHT, SHINY & CLEAN SURFACE. The workpiece should be moved TOWARD the direction of the wheel, using a MEDIUM to LIGHT pressure. The correct pressure must be applied to the workpiece to provide the best finish economically and safely. Inadequate pressure will give NO buffing action. 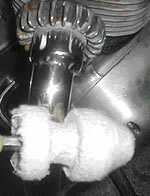 Excessive pressure will cause the buffing wheel to slow down or actually collapse. This can also result in burn marks on the workpiece. For best results your wheel should maintain a surface speed of between 3600 & 7500 Surface Feet Per Minute. (SFPM). The higher your speed, the better and quicker your results. Formula for calculating surface speed of wheel in SFPM. Therefore an 8” wheel @ 3600 RPM =2 x 3600 = 7200SFPM. 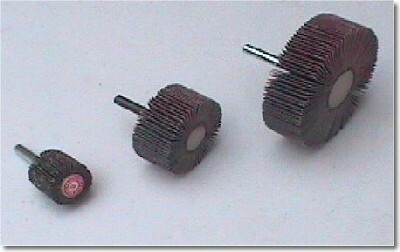 Spindle speeds can be increased by a step pulley on a motor shaft. For the workshop where only the occasional piece of work needs to be buffed, an economic alternative to purchasing a special machine is to simply adapt a bench grinder. Whilst this does not have the extended shaft, it can still do a formidable job. All the guards need to be taken off and the grinder mounted on the edge of a workbench. This will allow access to the wheel from many angles. Alternatively, a small used washing machine motor can be used. With access to a lathe, a simple pointed taper can be made to fit over the shaft. Then the buffing wheels can be aimed on to the point. On smaller pieces, an electric drill with one of our shank mounted buffs will do an excellent job. Some of our customers have even placed a large hand grinder in a vice, then changed the grinding wheel for a buff. These machines usually have very high speeds with good power, so they should be considered as another option. Whenever you are making up something to do a buffing job, your prime consideration should be your safety. If the buff pulls the piece from your hands, you should consider where it is likely to go. Remember it will be traveling at a fair speed, so no one should be in its way! Is the machine mounted safely? It will have to stand a fair amount of abuse, so make sure it is WELL fastened down. DISCLAIMER - Buffing machines can be dangerous. We accept no liability for their use/misuse or for accidents caused by the removal of guards. THE UNSAFE AREA which is rotating towards the workpiece. THE SAFE AREA which is rotating away from the workpiece. The division of these two areas is marked with the dotted line on the above drawings. The workpiece must only be applied to the area of the buff that is rotating AWAY from the workpiece. You should ensure that you are completely aware which area is which, otherwise you could have a serious accident. Objects being thrown away from a buffing wheel can be traveling at very high speeds, which can result in some very unpleasant and potentially deadly accidents! When buffing parts have sharp corners, edges or hooks, they should be offered to the wheel with the edge flowing away from the buff, so the part does not catch. Operators should ALWAYS wear SAFETY GOGGLES, APRON, GLOVES and DUST MASK. 1) Aluminum Side Cover with one deep scratch. To successfully remove the scratch, ALL of the material around the scratch has to be disposed of. In our example, this means a lot of aluminum! Initially, we are concerned with getting as much aluminum sanded off as quickly as possible, so we would use the coarsest abrasive available, say a 40 grit sandpaper on a flat block. It would be of NO USE to try to buff out this deep scratch with a buffing wheel, because the wheel would remove more material from the hole, as well as the surrounding areas. By keeping the abrasive on a flat block, no further material can be removed from the hole. As the scratch is lessened, the grit size of paper is reduced from 40, to 80, 120, 240, 320 and finally 600. Once the surrounding material is removed, then the actual polishing can be started. Buffing compounds will be determined by the size of the scratches. If you have used a 600 grit paper, you may like to proceed directly to a white buffing compound. If fine scratches are visible, then you'll need to 'back off' and go to the black compound before retrying the white. 2. Aluminum Side Cover - just dull. Obviously, it would be a step backwards to start treating this piece by using the technique in our first example. As there is no large metal content to be removed, you could virtually dispense with the sandpapers and move directly to the polishing aspect of the part. 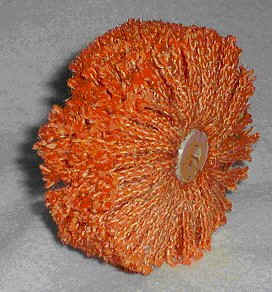 The Brown buffing compound with a spiral sewn wheel could be employed to see if the shine is good enough. If not, then use a black compound, and then rework the part using the brown compound. Many wheels are prepainted, directly over a rough sand casting. Remove the paint using VHT Stripfast, to expose the aluminum. The 'pimples' caused by the sand cast have to be removed to flatten the metal ready for polishing. Because of the difficult contours of the wheel, it is virtually impossible to sand with a flat block, so this is where Greaseless Compound comes in. 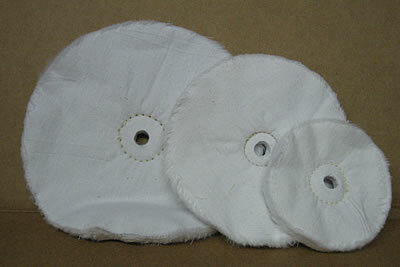 Start off with the 80 grit, using a spiral sewn wheel or, for the awkward areas, a felt bob. Then proceed through the various grit sizes of Greaseless, until the metal is smooth , all 'pimples' are removed and an even 'flat' finish is achieved. The polishing should only begin once all traces of 'pimples' are gone. Use Black Compound for most of the polishing work, and finally, on a fresh or cleaned wheel, buff lightly with the Brown compound. Use this chart to determine which wheels and compounds to use to polish different metals. This is a guide...experienced polishers will vary the materials used to suit the application and their technique. This chart serves as a good starting point for beginning polishers, but feel free to experiment. BLACK = Emery Compound, a course abrasive material for removal of scratches, pits, paint, rust etc. 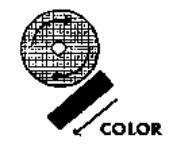 BROWN = Tripoli compound used for general purpose cut and color on most soft metals. 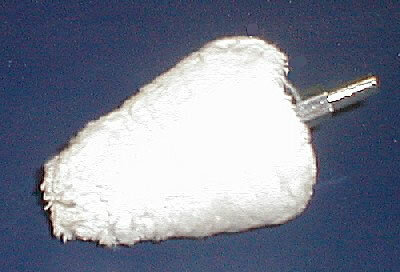 WHITE = Blizzard compound, used for color and final finish of harder metals, has a cutting action. RED = Jeweller’s Rouge, designed to polish without any cutting action. Safe on thin plates. Use on its own wheel. BLUE = A dryer, almost greaseless wheel - designed to polish without any cutting action. Safe on thin plates. Use on its own wheel. GREEN = Used exclusively for Stainless Steel. B = Final Cut & Initial Polish - At Stage B, you should first use your wheel with a cutting action, then finish with a color action. Sisal is a slender, hard, cellular strand of fiber that has demonstrated its great strength and tough resiliency in the form of binder twine, cord & rope for many years. These qualities, along with its natural abrading and grease absorbing characteristics, provide an ideal buffing wheel fabric. 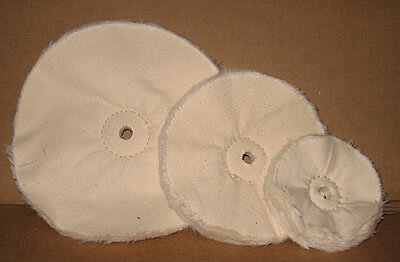 Sisal buffing wheels will provide both polishing and cutting action. They will remove stretcher strains, orange peel, polishing wheel grit lines, light die marks, etc. 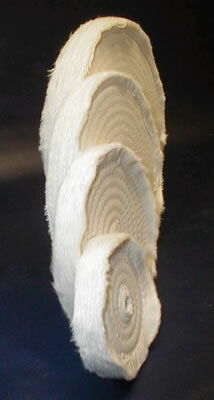 To effect a fast cut, use a sisal wheel with the Black Emery compound or any of the greaseless compounds. wheels are pre-raked to accept compound immediately. cotton to get into awkward places more easily. If you have an object with fine details and awkward crevices, then this is the wheel to use. Canton Flannel is a very soft material, and therefore is ideal for polishing items where a gentle touch is needed. 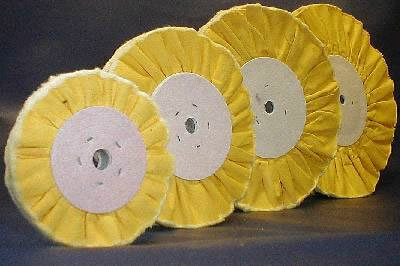 Canton Flannel wheels are used in the jewelry trade to polish items with gold or silver plating, where no removal of metal is desired. They can also be used to polish plastic and lacquered items such as guitars. Domet Flannel is the softest buffing material available. It can be used in any situation where an extremely soft touch is required. These buffs are sewn with two rows to slightly stiffen the buff.This improves the speed of the final coloring operation, giving you performance somewhere between a spiral sewn and a loose wheel. These buffs are specially treated to give longer life than standard buffs. They cut and color faster and are vented to keep the workpiece cooler. Hard center allows fast mounting to tapered spindle for quick change. Use with any compound. 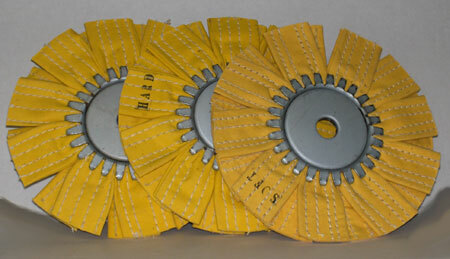 The folded pleats hold more compound and keep the part cooler, resulting in a being twice as fast as a Spiral Sewn wheel. 10” wheels require 3” washers. These wheels are softer than their yellow cousins. Thousands of thin cotton string strands will buff all types of plastics, including bacolite, to a shiny surface. The buff is specially designed to keep the plastic cool. Bring side markers, turn signals, tail light lenses to shiny, like new condition. Thousands of 1-3/4” long cotton strands reach deep into details to gently polish and shine without overheating and melting plastic. Use in conjunction with our Plastic Glo Compound. 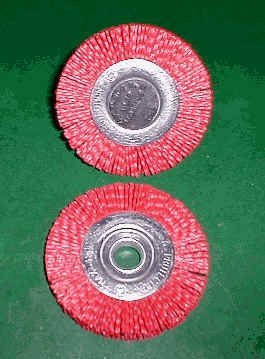 An aggressive wheel, designed to buff irregular contoured metals, especially useful for buffing of checker plate. The treated sewn cloth fingers penetrate into crevices etc. and at the same time reduce friction eat buildup, so reduces the possibility of distorting thin metal panels etc. Use with Greaseless or black emery compounds. The wheel comes with a 5/8” hole in the metal center. ½” inserts are available. Fits the Makita type Buffer/Polishers for ultra fast buffing of large surface areas, such as RV’s, boats, trailers, trucks, etc. Diameters are 2.5, 3.5 & 4.5 inches. Ideal for buffing contoured shapes such as wheels. Use with any compound on a drill or flexible shaft. Ideal for buffing the flatter areas, especially wheels. Use with any compound. Good for using greaseless for removing cast casting marks in aluminum. The pointed end is ideal for buffing inside holes and crevices, like the lug nut holes in wheels. Made from soft cotton. Use with any compound. the abrasive is already impregnated in the wheel. Gives metal a "satin" appearance. used on an electric drill or the Flexible Shaft. compound, then change to a medium compound and finally a fine compound, just as you would using sandpaper. We developed a special buffing wheel that fits straight into a drill chuck. The unique shape allows the buff to rest on the pipe without spinning off. By simply rotating the drill, all angles of the pipe can be buffed rapidly. The tapered end allows you to get into difficult corners. 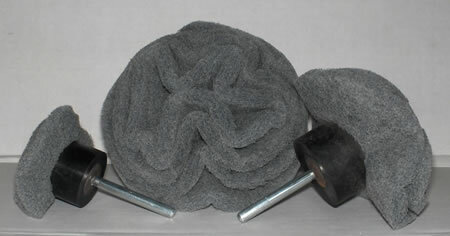 This buff is ideal for almost any tubing, such as handrails on boats, handlebars, tail pipes etc. Use with almost any buffing compound, but is especially useful with Blue Begone liquid polish.